Sorry for the delay again, been pretty busy recently. Four castings are scheduled, three are modified variants of existing castings, and one is a recolour. Two more releases of the Subaru 360 have been announced, both specially boxed releases celebrating the Subaru Web Community, an official Subaru website for fans to gather. The sides each feature the mascot character of the website, and both have the opening engine cover. This is the first release of the 360 with the open convertible top, as the 360 was first released as a regular two-door for October 2018. 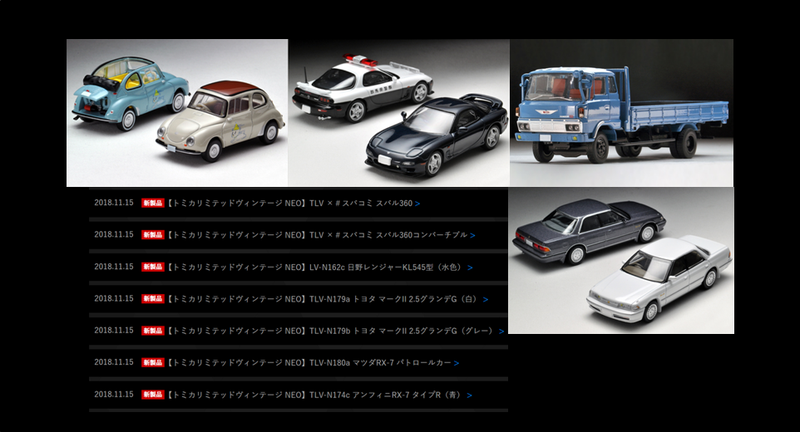 A police-specification ɛ̃fini RX-7 (LV-N 180) and a Montego Blue Type R (LV-N 174) have been announced for March. The police-spec version features the traditional antenna, siren, and deflector. The Type R is largely the same as the silver and yellow versions released in September. The Hino Ranger KL 545 (LV-N 162) is a recolour of a cast depicting a popular 4-ton flatbed truck, now in pale blue over black. Prior releases were in dark green over red, and plain white over black. Another release of the X80-generation Toyota Mark II (LV-N 179) has been announced, this time a 1990-onwards 2.5 Grande G, a top-of-the-line model. The release previously announced for February represents a sportier 2.5 GT Twin Turbo, featuring the 1JZ-GTE inline six.